New drop leg holster in British DPM from Kombat. This is the classic foldover shape tactical holster, with adjustable thumb break, spare magazine pocket closing with velcro, two adjustable and elasticated thigh straps an extendable drop leg strap with belt keeper. The bottom of the holster is wide to allow pistols fitted with LAM units or torch units to be worn in the holster. 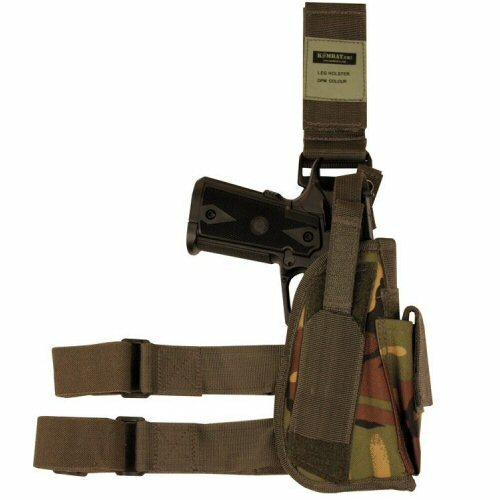 The body of the holster is made of 1000D Cordura nylon and the strapping is olive green. The holster is fully padded with enclosed foam to protect the pistol. Accessories are for illustration purposes only and are not included.